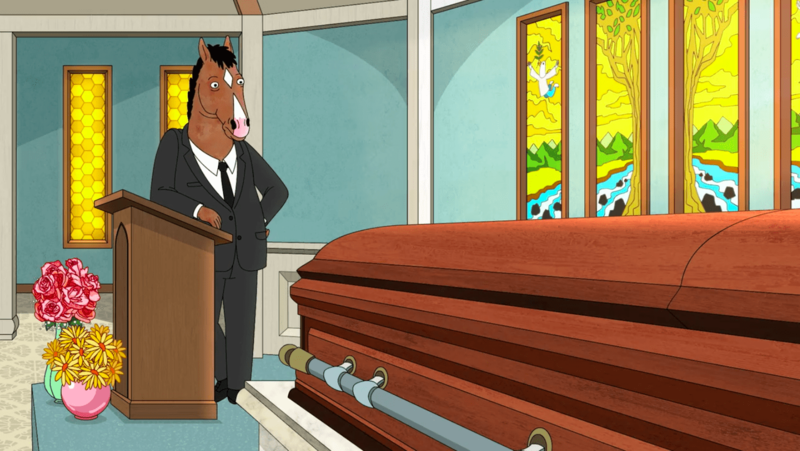 Bojack looks to his mother’s casket during his eulogy for her in Episode 6, “Free Churo”. Photo from netflix.com. The Netflix Original “BoJack Horseman” has returned for its fifth season. This year, we see BoJack like never before as he copes with old issues and deals with new ones. 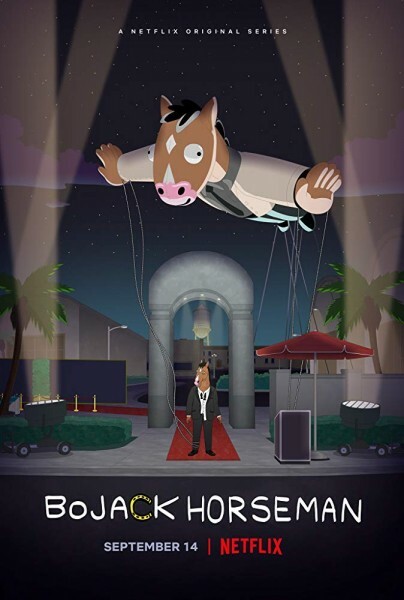 Before I get into the Season 5 spoilers, let me tell you what “BoJack Horseman” is about, if you’ve never watched it. Here is the reason everyone should watch this show: it revolves around a character that is stuck in a fictional sitcom, thinking that his life should be that way, but it is not, at all. Give BoJack a chance, he will teach you to never rely on other people and that you have to try to change but is trying, changing? Watch and find out. This might be the best season of “BoJack Horseman.” I have never been so impressed with the pure, well-thought-out character development of all characters throughout the show. It left me speechless many times throughout the 12-episode season. Episode six should win an Emmy. It was AMAZING. After the opening scene, which was very depressing, we got 20 minutes of BoJack giving a eulogy for his mother. The entire episode was BoJack just talking, and let me tell you, it was unbelievable. I’ll get to that later. Let’s go through the season. BoJack started out the season really trying to better himself and he doesn’t want to be alone. He seemed happy, or at least like he was trying to be. He was starring in a new TV drama called “Philbert” where he is a bad cop. He was excited to finally do something good. Then we see that Diane, BoJack’s best friend, is really struggling this season. Recently divorcing Mr. Peanutbutter, Diane has a new haircut and is figuratively darker than ever. As the season went on, all the characters were dealing with relationships, friendships and none of them were close to perfect. The show keeps it real, as always. One of the best things about this show is its philosophy. It’s very ethical, or they at least acknowledge what is right and what is wrong politically. The writers really focus on how the generation of baby boomers were as adults, which basically shows how our parents may have been raised if our grandparents were born after World War II. Now, back to Episode Six. When the episode starts after the opening credits and BoJack just begins talking at his mother’s funeral, I didn’t think anything of it. But after about five minutes, I thought, we are about to get 20 straight minutes of dialogue, and I was honestly so excited about it. Here are some quotes that were really great. “You can’t rely on other people.” That is a constant line throughout the series. Then here is the best part from that episode. Are you kidding me. Writing does not get much better than that. BoJack has been and will always be a broken horse, man, whatever you want to call him. But it’s because of his parents, and he really dug deep during his eulogy for his mother, who he hated. I know, it’s a fictional cartoon about a horse, but it made me feel grateful about the life I live. Anyways, BoJack always thinks of himself as a victim. But he’s not. He knows he’s not, deep down. He always tells himself he’s okay, but he’s not. And I think that’s something a lot of people do in life. We see people who always look like they’re on top of the world, like they’ve got it figured out, but they’re still human. They have heartaches, they’ve made mistakes. They just don’t let other people see them. Toward the end of the season, BoJack really got romantically involved with his co-star Gina. He had to “protect” her from getting hurt, which is very different. He used to only try to protect himself. His growth is impressive but still, he has to keep getting better. BoJack crashed his car so that he could get his hands on more painkillers. Every time you think BoJack is on the right path, he finds a way to mess up. It’s never-ending. Because of the drugs, he physically hurt Gina on set without knowing. Again, he has to fix it. The season ends after his TV show becomes successful and then gets cancelled because of the downfall of the network that it was streamed on, thus, setting up next season as an adventure to find a new network. Lastly, Diane and BoJack talk again. BoJack FINALLY decided to get REAL help as he checked into rehab with Diane waving goodbye, getting into her car and driving into the sunset. The show portrayed its recurring theme that everything falls apart, once again. It was a season so well done, it makes me want to re-watch the entire series over again. This truly has been one of the best seasons of “BoJack Horseman.” I can’t wait for Season six.